To buy tickets, scroll down to the bottom of this page. 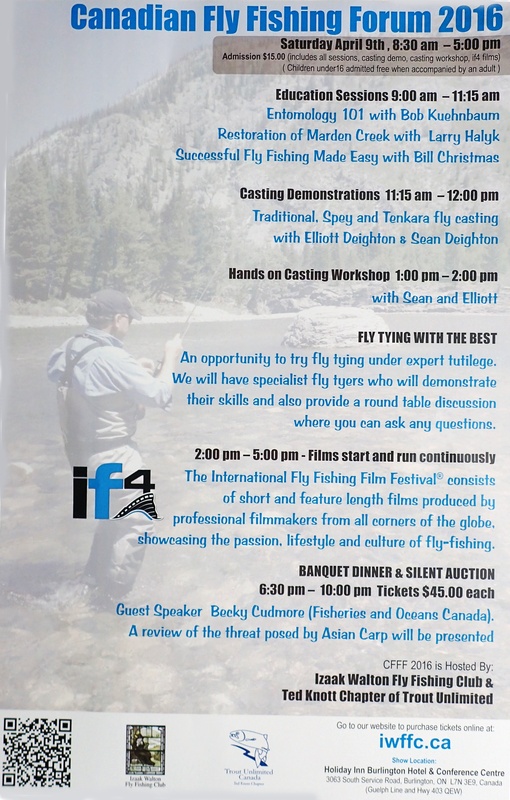 They will demonstrate the standard fly rod casting techniques, two handed rod casting and, new to this year, tenkara rods will also be demonstrated. Elliott and Sean will also hold a hands on workshop for the beginners and intermediate casters. The workshop will provide a rod that can be used or participants can bring their own. Entomology 101–Bob Kuehnbaum. A successful fly fisher needs to know something about bugs and if you need to know more this is the session for you. Bob has been fly fishing for 40 years and will provide the need to know stuff from a fly fisher’s perspective. Restoration of Marden Creek– Larry Halyk “The ecological restoration of Marden Creek”, an 11-year project, initiated by the Wellington County Stewardship Council, and Trout Unlimited Canada, to improve water quality and to restore Marden Creek to a cold water stream capable of supporting brook trout – all the way from its headwaters to its confluence with the Speed River”. Larry has been instrumental in this effort and is passionate about the topic. Successful Fly Fishing Made Easy – Bill Christmas has been fly fishing for more than 50 years and over that time he has compiled some very simple but important strategies and tactics to help every fly fisher. An opportunity to try fly tying under expert tutilege. We will have specialist fly tyers who will demonstrate their skills and also provide a round table discussion where you can ask any questions. A review of the threat posed by Asian Carp presented by Becky Cudmore (Fisheries and Oceans Canada). 9:00 to 9:45 am Entomology 101. 9:45 to 10:30 am Marden Creek. 10:30 to 11:15 am Successful Fly Fishing. 11:15 to 12:00 Casting Demo. 1:00 to 2:00pm Casting workshop. 2:00 to 5:00 pm Films start and run continuously. 6:30 to10:00 Banquet. Asian Carp in the Great Lakes What’s next? The guest dinner speaker will be Becky Cudmore. (Fisheries and Oceans Canada/Pêches et Océans Canada). These tickets entitle admission to all seminars, the films, and to to the fly tying and fly casting demos. Please bring your Paypal receipt with you to facilitate registration on the day of the Forum. Any remaining banquet tickets can be obtained by emailing Carl Johnston.